I am currently working on a big design project remodeling and decorating my fabulous client's sizable home. We are practically gutting the master bath, the guest bath, and one of the powder baths. In phase two, we'll tackle the other powder bath and the secondary bathrooms for the children upstairs. So, as you can imagine, I have been living, breathing, and dreaming about bathroom design lately! While the bathrooms I am currently working on are cohesive within the grand scheme of the house, they each have their own personality while reflecting my client's taste. Until I can give you a proper sneak peek of this project, here is a round-up of some beautiful bathrooms that have recently inspired me on Pinterest. 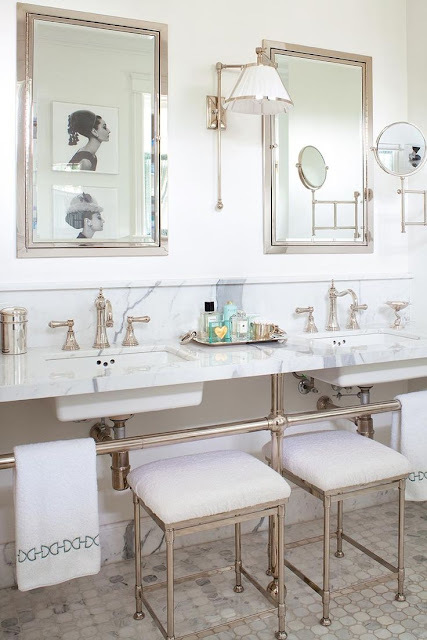 From this group of images, it's pretty obvious that my favorite bathrooms are filled with classic elements: white cabinetry, vintage-inspired plumbing fixtures and fittings, marble whenever possible, and graphic tile patterns to add a fun punch. 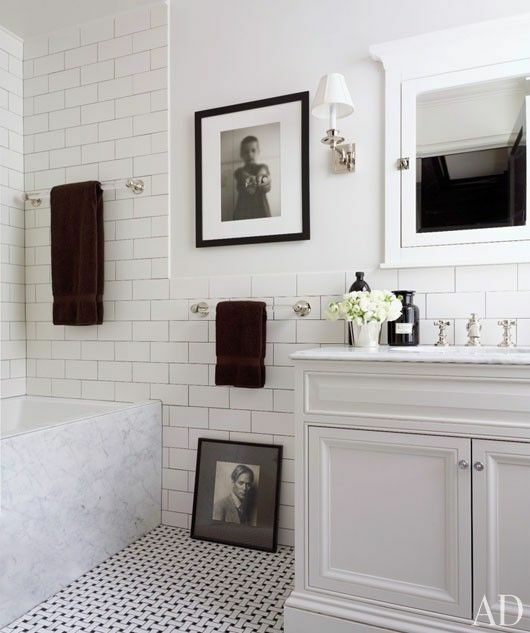 Do you gravitate to a certain style of bathrooms? Do you have a favorite in this post? Love those bathrooms! Hey Paloma, I sent you an email, please reply when you get a moment. A bath with marble and subway tile...I'm there. I haven't seen chevron tiles before but fortunate to see it here. Herringbone marble tile is also fantastic, so can you recommend any Tiles Exporters in India for me home ? 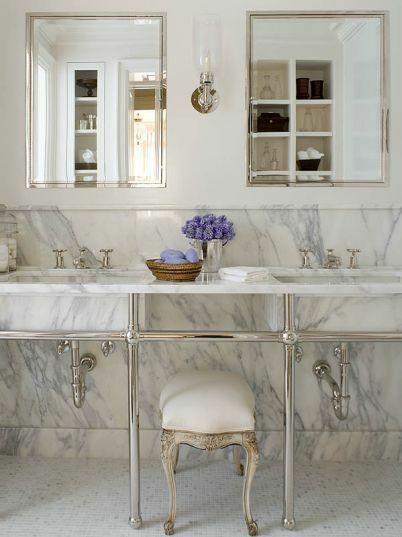 A marble bathroom is simply perfection! 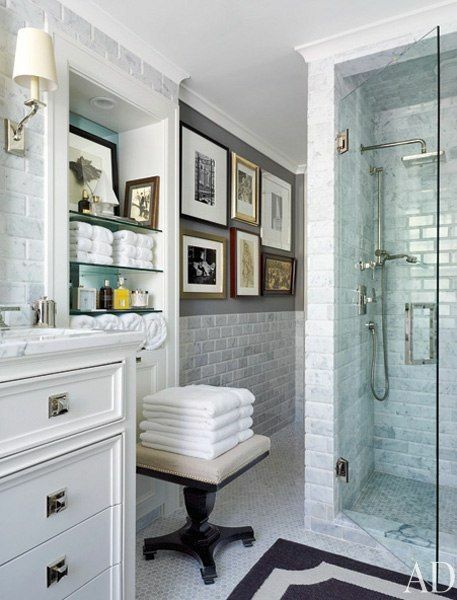 I love every single one of these gorgeous bathrooms! I'm working on one now in a 1900 Italian Renaissance home and the kitchen too! What a treat that doesn't come around very often! Lots and lots of white and calacatta marble! yum! Have a very good Organized Bathroom blog. I really appreciate you for this good work keeps it up. You can also find a very good blog at Prodigg. 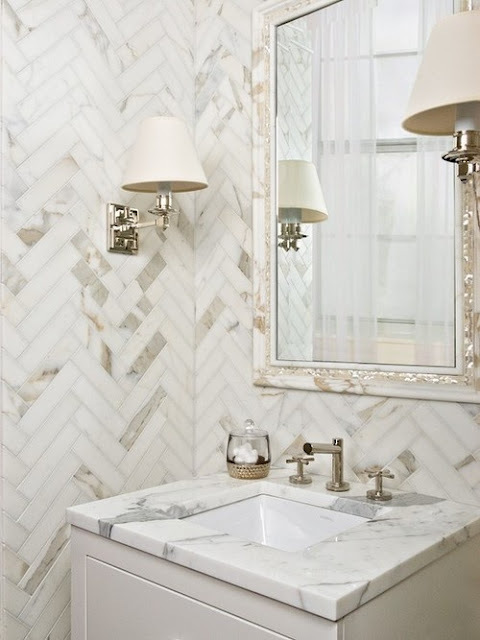 Having a marble bathroom is excellent, not only because it looks beautiful, but it is easy to clean. As a professional cleaner, I know from my experience that it requires specialised products, but it is shiny and clean. Great designs I love this creativity.Marble is always beautiful but You can try with Granite,it also gives best effect. I have a long double vanity, and no idea what to do with the large space in the middle. Suggestions!